Blizzard Warning For The Cloudcroft, NM Area Friday! Special Web Briefing - NWS El Paso. Special Web Briefing - NWS Albuquerque. A very rare "Blizzard Warning" is now in effect for the Cloudcroft, Sunspot, and Apache Summit areas from 5 AM MST - 5 PM MST tomorrow. This also includes surrounding areas in the southern Sacramento mountains above 7,500' MSL. Southwesterly winds are forecast to become sustained at around 35 - 45 mph with gusts near 55 mph tomorrow. These high winds when combined with the anticipated heavy snowfall of 3" - 5", will cause white out conditions, high snow drifts, and extremely dangerous driving conditions in these areas on Friday. Life threatening conditions may occur if you are caught out in the open in your vehicle without the proper protection from the elements! 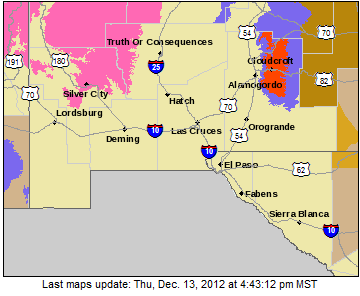 Winter Weather Advisory Lincoln, Co.
High Wind Warning Guadalupe Mtn's Friday. High Wind Watch For Chaves/Lincoln Co's NM Friday. A dangerous winter storm will bear down upon southeastern New Mexico and nearby areas tomorrow. High winds and blowing dust will plague the southeastern plains. Southwesterly wind gusts are forecast to be in the 80 mph neighborhood across the Guadalupe Mtn's. Southern New Mexico may see these winds gust up to around 70 mph. Chaves County will see these winds gust up to around 65 mph. Eddy and Lea Counties are expecting to see at least 45 - 55 mph gusts. Blowing dust is also expected to create some problems on our local roadways. Visibilities will suddenly drop down to zero with little to no advanced warning in some of our more dust prone locations. Wow for the Sacramento Mtns...if only that wind would not be as bad, and it would snow 2-3x that forecast!